The book I would like to talk about this week is to be published by Storey also. 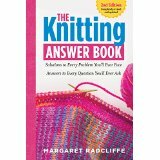 The Knitter’s Answer Book, 2nd edition by Margaret Radcliffe really is the answer book. I like that questions are simple, filled with commonsense, and the rather comforting feeling that I am not the only person to ask these questions – even after knitting for as many years as I have done. Again the directions are clear and the graphics are simple so using this book is a pleasant experience. Yesterday I was approached by a woman for whom I had knitted several scarves and she asked for a book for her daughter-in-law to use to move beyond her basic scarf knitting. I told her about the current edition, but also let her know that this one is to be published on Feb. 1, 2015. I know it will be on my shelf as soon as the mailman delivers it. I highly recommend this book for both the novice and the experienced knitter.